TURF Lodge and the wider West Belfast community have been sending messages of support and prayers to Fr Matt Wallace after the much-loved Parish Priest fell ill.
Fr Matt recently spoke to the Bishop of Down and Connor, Noel Treanor, to inform him of his decision to take a temporary leave of absence from the Holy Trinity Parish. 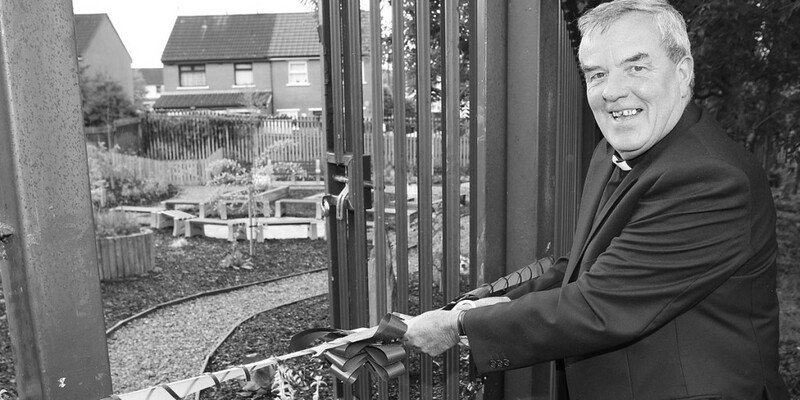 Dearly loved by many for his dedication to the parishes he has served during his long service in West Belfast, Fr Matt made the headlines back in 2003 when he bravely tried to prevent a burglary at St Martin’s Nursery School. Fr Matt was stabbed in the nose with a screwdriver as he seized the burglar who was reported to be high on drugs. One parishioner wished the Wexford-born priest a speedy recovery. “I think I speak for everyone in the parish when I say that he is Holy Trinity and he is Turf Lodge, he has been here for over ten years and has given so much to the community.